Icosit Grouts are safe to use without breathing apparatus and are ready to use after mixing the 2 components in under 90 seconds, proven throughout the world as the best long lasting load bearing grouts. Used in hundreds of Streetcar/Tram/Transits. This is designed as a pourable load bearing, resilient levelling and bedding material, for fixing embedded grooved/girder guard rails. It reduces vibration and insulates against stray currents and is shear resistant. Shore Hardness, A 35 compressible. This is an injectable, flexible, load bearing noise and vibration resistant grout. It fixes track components to rigid substrates/slabs and steel plate. This type has been in use throughout Mexico, USA and Canada since 1981 without a failure. Shore Hardness, A 55 compressible. It is similar to the KC340/4 but is pourable around suspended rails in a channel or trough. Slightly harder than KC340/35 and used in the USA and Canada for in-street embedded “T” and girder guard rails, on Transit Systems. Shore Hardness, A 50 compressible. It is the slightly harder version of KC 340/45 designed for heavier loads. Shore Hardness A 65, compressible. As per KC340/1&2 it can be injected or poured, it is harder, Shore A 75, again for both injections under tie plates or pourable for in street embedded rails. This is the very high load grade suitable for use under container gantry cranes on docks. It avoids the use of steel plates and rubber mats as it is load bearing; only clips are necessary for holding the rail in place. It can be poured or injected; it has become the fixation of choice in Europe as cement or epoxy grouts can deteriorate over time. You can expect 25+ years of life using Icosit. This is a 1 pack, ready for use, reaction-curing Polyurethane sealer. It is an adhesion promoter as a pre-treatment of dry concrete, steel and asphalt surfaces. Use it before applying all the Icosit grouts. It is tough and highly abrasion resistant. Applied by brush or roller. It is an elastic, hand applied, joint sealer. It is used between rails and adjacent concrete surfaces. It can be deformed up to 25% by road surface vehicles and has excellent chemical and mechanical resistance. It is a flexible polymer adhesive particularly good for fixing concrete filler blocks to the web of grooved rails for in-street installation of trackwork prior to using pourable Icosit grouts. Applied by trowel. This is a 2 pack Epoxy binder with multiple uses in the rail construction industry. It is especially suited for fixing anchor bolts of rail fixation systems and often used with the injectionable Icosit grouts. It is a heavy duty, load bearing pourable levelling grout for undersealing tie plates and is good for bonding between old and fresh concrete. HJ Skelton at +1 (877) 235-1883. Since the first application of Icosit KC330 in Railway Tunnels in 1970, the Sika Range of Elastomeric Grouts have been used in many thousands of locations in Automatic Light Rapid Transit, LRT’s, Mainline High Speed and Freight Lines, Heavy Mass Transit, Historic Trolley Lines, Crane Installations and more. Eliminating the need for shims. Absorbs noise and ground borne vibration. Changes it's volume under load/pressure compression. 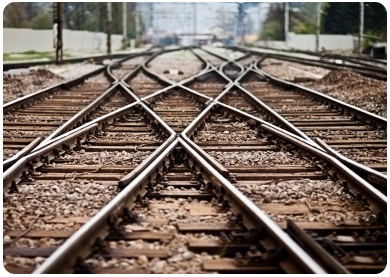 Strong adhesion and cohesion eliminates rail expansion and contraction, and prevents penetration of water and oils. 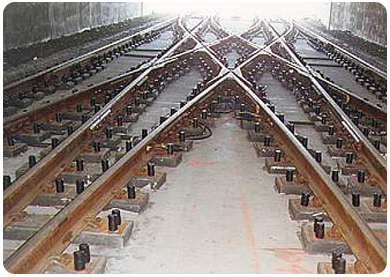 The highest precision is required in building special trackwork. On direct fixation slab extremely accurate elevation is achieved when the base plates are set with Icosit Grout. 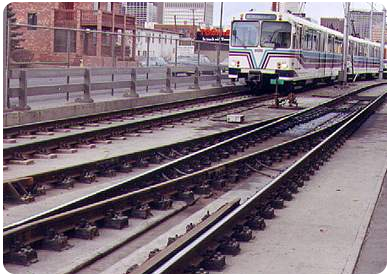 Calgary LRT Canada, Big-4 Crossover Icosit KC330/6 30 years in trouble free service. Trackwork supplied by Skelton. KC300 series of grouts are compressible (unlike pure elastomers) and therefore absorb vibrations started by the wheels on the rails. Installation of new rail systems can cause noise problems in sensitive buildings such as hospitals, concert theatres and residential buildings. Icosit grouts dampen structure borne noise and help to protect the environment. 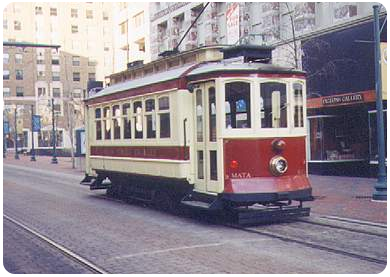 The Memphis Trolley passes close to the Concert hall and Convention Centre. Icosit prevents noisy distractions and absorbs ground borne vibrations. With modern Light Rail vehicles DC powered traction returns the current through the running rail. 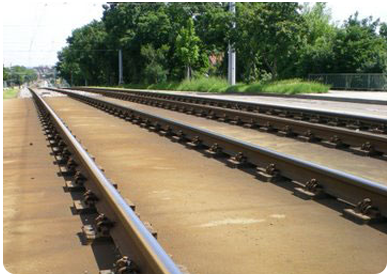 Icosit isolates the rail from the trackbed thereby preventing stray currents and protecting against signalling malfunction, electromechanical corrosion and data transfer interference. D.A.R.T. 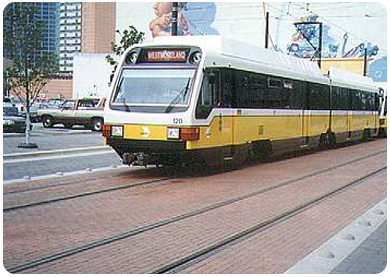 in Dallas, Texas has all the track in the Central Business District for which everyone is grateful and embedded in Icosit. With preparation using primers on the steel and the concrete, Icosit produces a powerful bond to increase the stability and safety while preventing water from getting into the fixation system. T.T.C. in Toronto glued the baseplates to the concrete with Icosit on a 7% gradient. No anchor bolts were needed. Portland, OR. 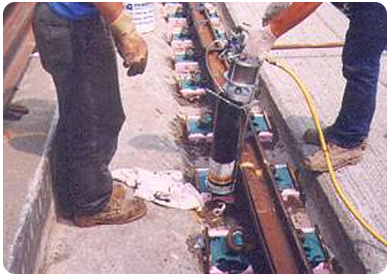 Icosit used to level, insulate and reduce vibration in a Double Crossover, U.S.A.
On bridges, tunnels or slab track, Icosit can be used without hold down bolts into the concrete, its adhesive qualities have been proven in many places from 7% gradients on Toronto's Streetcar system to many bridges in Europe. Photograph taken at Karlsruhe on the KVV system's Slemensalle Bridge after 10 years without problems.